I have an idea I used in Iggy's room to share with you. When Iggy was a few months old, I went on a shopping excursion with my friend Stephanie. Among the stores we stopped at was Psychobaby, where you can make your own custom-printed onesie. Well, that was just too cool for me, so I spent around $25 (I think?!) to get a black onesie with red trim customized with Iggy's name across it in a tattoo font. I bought it in 3-6 month size, thinking it'd last us awhile and Iggy would get to wear it many times... especially for that price! And it wasn't like it would be passed down to another baby - it has his name on it! Well, uh, turns out that the 3-6 month onesie ran a little small. Boo. And I was sad for quite a while. But then I had an idea! I would turn his onesie into art for his room! I used a regular old IKEA frame and matted it with black matboard (I actually own a mat cutter at home - it's an art teacher thing, but it's paid for itself many many times over with framing artwork for us and my family - if you're at all interested, I strongly recommend buying one. You don't even need to go fancy. As long as it has the ability to bevel cut for your inner window, you're good to go.). I put white matboard behind the black matboard frame. 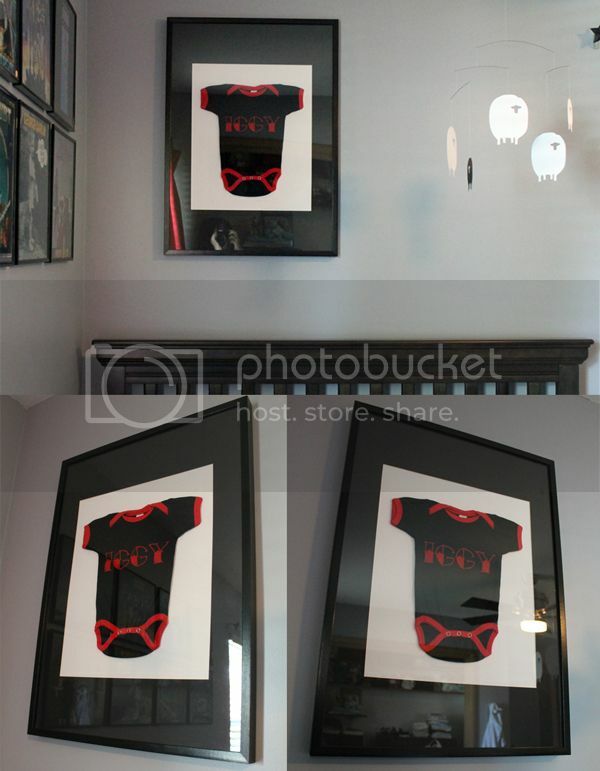 The onesie itself is sandwiched between te matboard and glass of the frame. IKEA frames have a good amount of wiggle room when it involves depth. I did use some clear packing tape, rolled, to help hold the onesie to the matboard before sandwiching it in, but once you fold back the little metal tabs to hold the glass and board in, everything is pretty darn secure. The result is pretty cool, if I do say so myself! Now his $25 onesie is still being used. We can all remember how teeny my little guy was, and he has some cool personalized artwork to decorate his room! 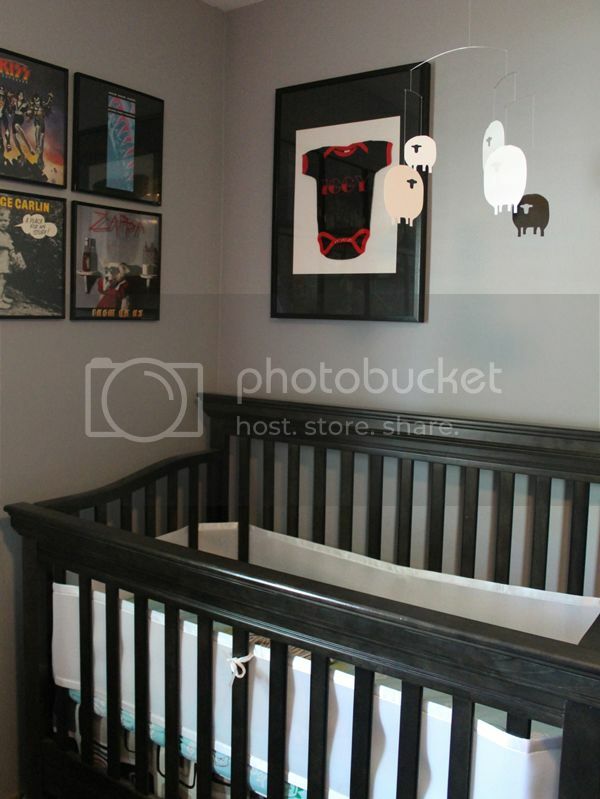 For more details and photos about Iggy's room, see my nursery tour post here. I rarely go out and buy artwork specifically for my house. I frame and hang all kinds of things you might not think to use as art. This is just one idea, and hopefully you can use this inspiration to frame something meaningful to you! It doesn't need to be "baby" themed. Do you have a favorite t-shirt, a swatch of fabric, or a pair of socks or gloves just waiting to be displayed as art in your place? Share! I love how you've decorated his room...so cool! By the way,I nominated you for a Liebster Award. Check it out here: http://windandthewillow [DOT] blogspot [DOT] com/2012/07/liebster-award.html Let me know if you decide to participate,I'd like to see your answers! I'm giving away free ads!!! Couldn't decide what color to paint them.